Photo courtesy of EVs Enhanced. November 23, 2018, New Zealand. We have become aware of over 60 reported failures (“failure” hereafter) of the electrically-driven brake control unit (called an ‘e-ACT Electrically-driven Intelligent Brake Control Unit’ by Nissan,”brake control unit“ hereafter) in Gen 1.2/1.3 Nissan Leafs manufactured between November 2012 and February 2016 (“vehicle” hereafter). We are aware of 46 reported failures in USA, 10 in the UK and Ireland, and 5 in New Zealand. Our research has led us to believe that these failures can be attributed to faulty ‘Series-A’ firmware that is written into the brake control unit at the time of manufacture (or a subsequent firmware update to ‘Series-B’). Analysis of the vehicle’s fault code history after a failure indicates that the other systems in the car no longer get any response when trying to communicate with the brake control unit. In other words, it appears that the brake control unit ‘crashes’, causing a partial failure in the overall braking system of the vehicle. We haven’t found anything that implies that these failures can occur in any other Nissan vehicle, or, any other electric vehicle. Specifically in relation to other Nissan Leafs, Gen-1.2/1.3 models manufactured in March 2016 and later have a revised ‘Series-C’ version of the brake control unit firmware, and we have not been able to find any reported failures in Nissan Leafs running this ‘Series-C’ firmware. Gen 1.1 models manufactured in 2011 and 2012, and Gen 2 ‘40kWh’ models now in production appear to be running fundamentally different classes of brake control unit firmware, and we have not been able to find any reported failures in these Nissan Leafs. results in increased braking distance. In Nissan’s words, “In this [special Assist] mode, the brakes are operational, but may require more pedal effort”. We assume that Nissan’s definition of ‘special assist mode’ describes the failures we are writing about here. Nissan has issued voluntary service recalls to update the firmware for affected vehicles sold in the USA, Canada and certain European Nordic countries in 2015/2016 from ‘Series-A’ to ‘Series-B’ firmware, but we are aware that failures kept occurring in vehicles which had this service campaign carried out (i.e. ‘Series-B’ firmware update apparently did not fix all of the problems present in the ‘Series-A’ firmware). Nissan specifies that their voluntary service campaigns were addressing a problem that could only occur in extremely cold climates of minus 20 degrees Celsius (minus 4 Fahrenheit) or lower. However, we have found failures that occurred in warmer climates of California and New Zealand, so we don’t believe the freezing temperature alone is the cause of the failures. Additionally, these service campaigns were either not made available or not compulsory for vehicles sold in the UK or Japan – almost exclusive sources for vehicles imported into New Zealand. We have been able to confirm that the ‘Series-B’ firmware is identical between right-hand-drive and left-hand-drive variants of the vehicle, and that the ‘Series-A’ firmware for generation 1.2 is identical between UK and Japanese models. We also have no information to suggest that the brake control units of the affected vehicles are different between the countries of first origin. Preliminary statistical analysis of the fragmentary data available estimates that between 2 and 15 such failures can be expected in New Zealand in the coming year if the number of these vehicles continue to grow at the rate seen over the past year. Globally, there could be tens of thousands of vehicles that are currently running either the factory-installed ‘Series-A’ firmware or the updated ‘Series-B’ firmware, and are therefore prone to this failure. In New Zealand, specifically, we estimate there are around 2,400 potentially vulnerable vehicles, with a vast majority still running the factory-installed ‘Series-A’ firmware version. We have become aware of a potential issue with the brake system in Nissan Leafs manufactured between November 2012 and February 2016. If you live in NZ, you can look your car’s registration number up on www.carjam.co.nz – on the first line “year”, the month of manufacture is listed in brackets, like “(2016-03)”. So far we know of at least five instances of partial brake failure in New Zealand and we are awaiting NZTA’s assessment of the risk and any potential remedies. Below, we set out what we know so far, but most importantly, we want to alert you to how you can react if you experience a brake failure: you may need to slam the brake pedal hard and right to the floor to get some braking! There will likely be strange noises, the brake pedal will feel rather different, and at first you might think there are no brakes at all. Note that even when pressing the brake pedal right to the floor, some individuals reported that they still had no braking force. The picture continues to be very uncertain, so if you can, please fill in the form on www.flipthefleet.org/leaf-brakes-logbook to share information about any issues you may already have experienced with your brakes. We would like to share your information with others to keep the EV community as safe as possible. For those new to our project, Flip The Fleet is a community project that empowers New Zealand-based EV drivers to play a vital part in building a brighter future for electric transport in our country. As you browse our Discussion and Resources pages, you’ll find a wealth of information on EVs, both quantified by the data we collected, and, from personal testimony of our participating kiwi drivers. Rather than writing a formal report, we would like to share what we’ve learned over the last few months via a ‘hypothetical-questions-and-answers’ structure, below. If there are some questions we’ve missed, please write to us at brakes@flipthefleet.org and we’ll do our best to add them in as time allows. Here we go! I have one of these vehicles - is it safe for me to drive it? We’d love to answer this question, but we simply can’t! We put this question to Nissan, but have not received their reply. Ultimately, we believe it is the role of the national regulator to make this judgement, as the definition of ‘safe to drive’ varies from country to country. In New Zealand, our regulators are New Zealand Transport Agency (“NZTA”) and New Zealand Ministry of Transport (“MOT”), and while we made both entities aware of our preliminary findings on October 22, 2018, via our memo, neither has provided us with a formal evaluation and a statement whether they consider the vehicles safe to drive by November 23, 2018. As soon as we are made aware of responses from either or both entities, we will add the appropriate links here. For now, you can find contact details for MOT by clicking here, and for NZTA by clicking here if you’d like to ask them this question. What do I do if I’m driving and experience a failure? According to information from Nissan, and our own findings, braking is still available, albeit in a reduced capacity. For legal reasons, it is inappropriate for us to make a recommendation on how to operate your vehicle, however, from reading this blog you may conclude that a logical thing to do in case of failure would be to push your brake pedal hard, as far as you can possibly push it, and keep the pressure on as long as required to come to a complete stop. If you take the above steps in case of a failure, you should expect to hear loud mechanical noises coming from under the bonnet. Because the braking capacity is compromised, you should expect the vehicle’s braking distance to be longer than normal. Note that some people who have experienced the fault have indicated that, even when they pressed down as hard as possible, there was still no braking action. Would I get any warnings of a failure? There are multiple reports overseas of brake system warning lights remaining lit after startup. If the car is driven and the failure symptoms are observed, the car may be unsafe to drive. It is important to heed any warning signs. Sometimes, turning the car off and back on can clear the warnings, noting it is likely there will be fault codes stored in the car and advice from a specialist should be sought. In other cases, the failure occurred while driving without prior warnings, although it is common for warning lights and fault codes to be present after the failure. Does a failure feel like a loss of the brake servo action in most other cars? No. In the Nissan Leaf, the brake control unit is designed for both boost action, and, for less mechanical brake pressure during regeneration. The brake pedal can therefore travel some distance without the mechanical brakes becoming engaged during regeneration. 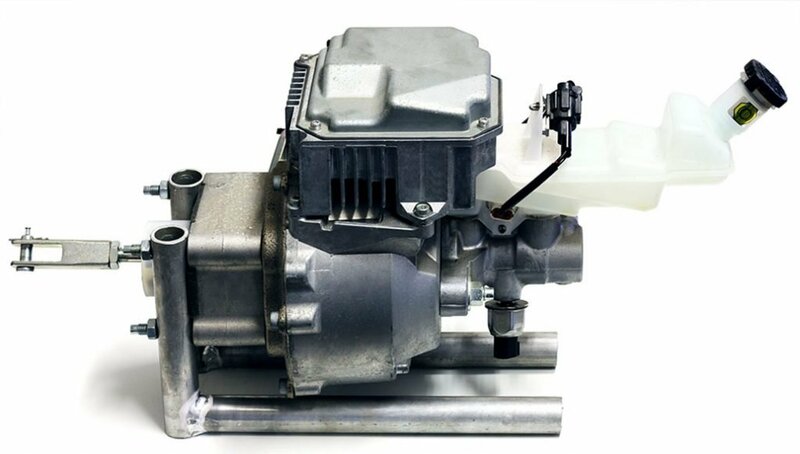 When brake boost action is required, the brake control unit motor adds extra force to the master cylinder. In the event of a failure, the brake pedal needs to travel a significant distance – Nissan state in the service manual that when control is stopped ‘The input rod crosses the cooperative regenerative brake control gap and contacts the master cylinder piston, generating fluid pressure’. From this point, high force is required without boost, like in most other cars in an event of a failed servo, but with the important difference that the brake pedal now feels quite close to the floor and drivers report an initial impression of no brakes being available. This surprise factor is an important consideration. What do I do AFTER I experience a failure? Because reduced braking capacity should still be available in an event of a failure, depending on your circumstances (e.g. you ended up stopped in the middle of the road), it may be safe for you to start driving once more to relocate your vehicle to a safe/r spot. If you decide to move the vehicle, just remember that the stopping distances will be longer and you need to press harder on the pedal whenever you wish to stop. We can’t comment whether you can or cannot legally continue to use your vehicle once you have experienced a failure, as we are not aware of any laws related to such scenarios – and any such laws will likely differ from country to country. Longer term, after you’re safe and have had a chance to re-assess the situation, we are aware of at least one case where the vehicle’s 12-volt battery was left disconnected for a period of time, and after reconnection of the 12-volt battery, the brake control unit resumed normal functioning. Once I scan my Diagnostic Trouble Codes (DTCs), should I be clearing old ones? Yes, but only after you recorded your DTCs somewhere for future reference. Clearing the DTCs after reading them is best practice, as this way, on your next check you get to see any NEW codes pop up (otherwise, you don’t know if they happened years ago, or a few minutes ago). Is this a problem for ALL electric vehicles? No, our findings presented on this blog post relate only to Nissan Leafs manufactured between November 2012 and February 2016. We haven’t found anything that implies that these failures can occur in any other Nissan vehicle, or, any other electric vehicle. I have a Nissan e-NV200 manufactured during this timeframe. Can my van experience this failure? We can’t tell you for certain that your van is free from defects, but we have not found any records specifically related to the failures discussed in this blog post. Your e-NV200 runs a completely different Bosch brake control unit, compared to the Hitachi units used in the Leaf, but we do not know if this removes the apparent risk of brake failure in the eNV200. What should vehicle owners do now to remove the risk of a failure? Unfortunately, we don’t know. We put this question to Nissan, MOT and NZTA, but have not received a reply. Should I be checking my 12V battery? A weak 12V battery featured in a number of reported failures. We do not have enough data yet to draw a definite causal relationship between brake failure and low 12V battery charge. If you have any symptoms of a weak 12V battery, such as the 12V battery warning light on the dash coming on or other warnings when turning the car on, we recommend having the 12V battery assessed by an automotive battery expert and likely replaced. Please note that the Leaf doesn’t always keep the 12V battery fully charged, so to properly assess the health of the 12V battery, fully charging using an external charger first is usually required. What about general wear-and-tear? Are older cars more susceptible to failure than newer ones? Typically, software will not age, and will continue to execute its function for as long as the hardware it’s running on is in good shape (assuming, of course, the software is free of bugs). Hardware, on the other hand, can deteriorate with age. Specific to the failures discussed here, we assume the hardware is actually fine, as the same hardware is used in other models of the Nissan Leaf without any reported problems. Please note that Nissan recommends replacement of the brake fluid every 24 months or 30,000 km. I thought Flip The Fleet had the goal of accelerating EV uptake? Flip The Fleet is first-and-foremost a science project – meaning that the results of our work are not always positive, and publishing negative results takes us a few steps back with our own mission. We often receive testimonials related to the downside of EVs, and we publish these, unedited, nonetheless. At the start of this year, the data we collected resulted in a finding of accelerated reported battery capacity loss in the 30 kWh variant of the Nissan Leaf, which has subsequently been remedied by Nissan firstly overseas and then in New Zealand, is one example of a negative discovery. We understand and acknowledge that our findings don’t always please all the stakeholders, including vehicle manufacturers, importers, dealers, drivers and various other organisations. But being a citizen science project, it is our moral obligation to publish the important findings (especially if it’s related to safety! ), warts and all, despite the negative impact these actions may have on ourselves, businesses, regulators and EV owners alike. The findings presented in this blog surrounding the reported failures of the e-ACT Electrically-driven Intelligent Brake Control Unit, perhaps, fall into the ‘negative results’ bucket. I’ve experienced a failure! Can I help Flip The Fleet make sense of all this? Yes. As the vehicle’s manufacturer deems this failure as possible only in extra-cold climates of minus 20 degrees Celsius (minus 4 Fahrenheit) or lower, and is therefore choosing not to provide the answers to most of our questions citing this temperature threshold, we are really low on detail and are very keen to understand what is actually going on. The only way we can do this is if you tell us about your failure event/s. We genuinely don’t know whether these failures are limited to the 5 cases we have documented in New Zealand and a few dozen from other countries, or, there are hundreds or thousands of such cases from all over the world. Please take a few minutes to fill out our online “Brake failure log” by going to www.flipthefleet.org/leaf-brakes-logbook so we can compile as much information on these failures in one place as we can, and present it to relevant regulators to aid their decision making on whether the potential of these failures is a significant threat to drivers and surrounding environments in their country. I have just experienced a braking problem. Do you still want me to fill in a brakes failure log? Yes please, file your report by going to www.flipthefleet.org/leaf-brakes-logbook ! We’ll keep the logbook going and monitor reports to check on trends and test various hypotheses about what triggers the problems. We’ll post updates on any new conclusions on this website. I haven’t experienced a failure, but, I have one of these vehicles. Can you let me know if and when a solution is found? Of course! Please fill out our online form on www.flipthefleet.org/leaf-brakes-logbook, making sure to choose “No” in the “Have you experienced a failure” question, and we’ll keep you up to date. I’ve lost confidence in my vehicle, and deem it unsafe to drive. I don’t want it anymore! What rights do I have? We’re not sure for other countries, but in New Zealand, private purchases of vehicles from licensed motor vehicle dealers are covered by the Consumers Guarantees Act. Consumer NZ has previously provided commentary on a previous Flip The Fleet finding, which you can read by clicking here. We have just asked Consumer NZ for guidance on these failures, and hope to post a link here shortly. Lastly, we are unsure whether the Consumers Guarantees Act provides you with any rights in situations even where a failure has occurred, or if you simply own a vehicle described in this blog post. Seeing it’s a Nissan, will Nissan fix my vehicle? We can’t speak for Nissan, and specifically related to New Zealand, it is our understanding that as the affected vehicles were never sold new in New Zealand, that Nissan New Zealand is not responsible for the maintenance of imported vehicles they did not sell. Additionally, we assume that Nissan’s statement to us of “Accordingly none of the Nissan LEAF units imported into NZ will be impacted by the [service recall situations discussed] above.” implies that Nissan New Zealand does not acknowledge the existence of the problem related to failures in New Zealand, meaning they are unlikely to provide remedy for a problem they believe does not exist. You can also read the comment of the CEO of Motor Industry Association on this question on page 11 of our comms list by clicking here. For countries other than New Zealand, we recommend you contact your local Nissan dealer, as support may be available for you. What are Nissan’s and NZTA specific recommendations relating to having your vehicle checked? Currently, NZTA and Nissan recommend to go to an authorised Nissan dealership/service agent if you have concerns and have your vehicle looked over. Afterwards, please report on the outcome to brakes@fliptgefleet.org – tell us what was checked, how, cost and send us a copy of any scans. Looks like you ask more questions than provide answers! What have you actually done to get some answers? During October 2018, we prepared a memo of our findings to date. You can download this memo by clicking here. On October 22, 2018, we emailed this memo to representatives from Nissan, as well as chief executives of both the New Zealand Transport Agency (NZTA) and New Zealand Ministry of Transport (MOT). We have subsequently exchanged many emails, receiving replies from the Chief Executive of the Motor Industry Association David Crawford, Managing Director of Nissan New Zealand Limited John Manley and Chief Executive of New Zealand Transport Agency Fergus Gammie. After receiving a first response from Nissan, which we felt was inadequate, we emailed Nissan once more on October 29, 2018 – this time, copying in the Minister of Transport, Rt Hon Phil Twyford and Associate Minister of Transport, Rt Hon Julie‐Anne Genter, as we felt this issue of safety was worthy of them being informed. Nissan has responded to our second request with further details, however, as their response did not address all of our questions, we asked some questions for the third time on November 2, 2018. Subsequently, we received a response from the office of Hon James Shaw, Acting Associate Minister of Transport, acknowledging receipt of our second email to Nissan. As at November 23, 2018, we have not received a response from Nissan to our third request for information. Full details of our communications can be downloaded by clicking here. What details do you have around the failures that occurred in NZ and overseas? If you download our original memo from October 22, 2018, you’ll see details of 5 cases that we are aware of happening in New Zealand. These start on page 5 (click here to download). Internationally, we are aware of a larger number instances. Please click on the following links to read for yourself: Speak EV (thread 1), Speak EV (thread 2), Car Complaints, NHTSA 2013, NHTSA 2014 and finally NHTSA 2015. Are you aware of any other instances of brake failure in these cars in New Zealand? We put this question to Nissan, MOT and NZTA, but have not received a reply. I know you provide a lot of links to various failure cases above, but how do you know these failures are real? Well, Henrik Moller – a founder of Flip The Fleet – had this failure happen to him first hand in July 2018 in New Zealand at around 2 degrees Celsius (36 degrees Fahrenheit). In addition, the existence of fault codes in the vehicle’s computer system post failure provided certainty that at least a number of the reported failures were not just due to the driver ‘imagining things’. So we’re pretty sure it’s a real thing, which can’t be entirely explained by Nissan’s recalls related to extremely cold temperatures. Do you believe that a significant risk exists of brakes of affected vehicles going into failure? Our calculations suggest that the minimum risk of the failure occurring in a particular year is about 0.2%. This figure is likely to be higher as there will be cases of failure that we aren’t aware of. Ultimately, we believe it is the role of the national regulator to make this judgement. Do you believe that this problem should be remedied as soon as practicable? Given that the issue relates to safety, and there appears to be a solution that may address the problem, it would seem prudent to implement it. We put this question to Nissan, MOT and NZTA, but have not received a reply. If ‘Series-B’ or ‘Series-C’ brake system firmware updates for these vehicles are currently being deployed in other countries, but are not available via Nissan New Zealand authorised service centres, would Nissan be willing to make these updates available here in New Zealand? We put this question to Nissan, but have not received a reply. There is some precedent, however, to Nissan supplying firmware updates in New Zealand. Will a brake control unit firmware upgrade resolve the issue of these failures completely? How will the risk be managed for affected vehicles already in New Zealand but not yet sold, and vehicles purchased overseas but still enroute to New Zealand? We brought up this question in our original memo to NZTA and MOT, but neither have provided their response to this question. Have you guys done any testing to find out the impact of a potential failure? Yes, we have done some informal testing by purposefully ‘turning off’ the brake control unit via a software command, as doing so simulates aspects of a failure. We had individuals who had experienced a failure try a car in this self-induced ‘failure mode’, and while they noted similarities, they felt that the test car had more braking ability than when their car had failed and there were differences in how the brake pedal behaved. Hence we can’t be sure this self-induced ‘failure mode’ fully replicates what happens when this failure occurs under normal conditions, thus these results need to be treated as potentially conservative. We ran some tests at various speeds in this self-induced ‘failure mode’, and have found the following at all speeds: braking continued to be available, much more force was required to push the pedal to get a braking effect, more pedal travel was required, loud noises came from under the bonnet and the braking distance was increased. We also noted another possible failure state where there were no additional mechanical noises, the brake pedal maximum travel distance was reduced, but still a lot of force was required to achieve any braking. Our rudimentary tests did not provide enough robust data for us to publish a full report. Regardless of our results, we believe that it is the job of the national road safety regulators to carry out such tests with proper testing equipment, interpret the results and take appropriate actions. A key observation was the surprise at the extent of pedal travel before braking occurred in the primary failure state. Ok, I know you’re not publishing the results of your testing, but can you at least give us a rough idea of what you found out? Sure. When we tested a vehicle with its brake control unit functioning properly, we measured a stopping distance of 2-3 metres, decelerating from the speed of 30 km/h. When we turned off the brake control unit using a software command, we recorded stopping distances of 4-6.5 metres, decelerating from the same speed of 30 km/h, noting increased pedal travel and force required. We encourage you not to look too much at this data, as our testing methodology is far from perfect, but we hope it gives you an idea of a possible stopping distance increase if you experience a failure at a speed of 30 km/h or so. Also, in New Zealand, we have a so-called Land Transport Rule. Part 2.3(6) of rule 32014/1 (which you can read by clicking here) that reads: “A vehicle, except for one specified in 2.3(2) to 2.3(5), and 2.3(7) to 2.3(11), must have a service brake that (a) acts on each wheel; and (b) is capable of stopping it within a distance of 7 m from a speed of 30 km/h.” We assume that if a vehicle cannot meet this rule during a Warrant of Fitness inspection, the testing station will not provide a Warrant of Fitness, and the vehicle will not be allowed onto New Zealand roads. So therefore, you may join these two facts together to make an assumption that EVEN IF a vehicle experiences a failure of the brake control unit, its impacted stopping distance may still be within tolerated guidelines for stopping distances as mandated by the Ministry of Transport. Or you may assume the contrary – either way, further testing is needed to establish what the result of a failure would mean in relation to the Land Transport Rule. How did your results stack up against any published guidelines on brake performance? While our tests at various speeds (30 km/h, and higher) showed that braking performance in the induced ‘failure’ mode was inferior to the normal braking performance of the vehicle, provided we applied sufficient force to the brake pedal, the stopping distances we recorded were similar to those assumed for an average car by the Queensland Government – click here for their methodology on how to calculate stopping distances. You may also be interested in some related information from New Zealand – click here to view. We cannot make representations about what stopping distances other drivers would be able to achieve in case of a failure, and whether these distances meet any published guidelines. If I experience a failure, should I use the foot operated park brake instead? The park brake only operates on the rear wheels and provides significantly less braking force than is available from the main brakes even in failure mode. While this may seem like a possible alternative, we understand that a park brake system is not intended to stop a moving vehicle, and using the park brake under motion may have other undesired effects such as loss of traction and/or loss of steering. As such, sorry, but we really can’t make a recommendation here. How do I check what firmware series I have? In other words, how can I check if my vehicle is prone to a potential failure? Looks like EVs Enhanced offer firmware updates! I’m in New Zealand, so should I get them to update my vehicle’s firmware? Firstly, while Walter Larason of EVs Enhanced has been instrumental in helping Flip The Fleet compile this information (and we thank Walter for this help massively), Flip The Fleet is not affiliated to EVs Enhanced. Furthermore, Flip The Fleet does not promote or endorse the products or services or any third party, nor recommend their use. Secondly, we have been told that EVs Enhanced are indeed capable of installing later firmware versions of the brake control unit onto certain Nissan Leafs – if you are interested in this service, you can find their contact details by clicking here. Thirdly, we do not know for sure that an upgrade of the brake control unit’s firmware will completely remove the chance of a failure occurring, reduces the chances of a failure occurring or perhaps even increases the chances of a failure occurring. I have a generation 1.1 Nissan Leaf (2011 / 2012 models). Does this blog post apply to me? Not that we are aware. If you’re unsure of the exact generation of your Nissan Leaf, a way to check it is to obtain your Leaf’s chassis number. You can do this by going to www.carjam.co.nz and putting in your number plate, and if you look down the page, the first few letters of the ‘Chassis’ field specify your Leaf’s generation. Alternatively, you can visit www.flipthefleet.org/leaf-brakes-firmware-check and follow this process to use LeafSpy to find out your Leaf’s generation. If your chassis number starts with ZE0, then you have a generation 1.1 Nissan Leaf, for which we are not aware of any failures. I have a generation 1.2 or 1.3 Nissan Leaf (24 kWh or 30 kWh) that was manufactured on March 2016 or later. Does this blog post apply to me? Not that we are aware. If you’re unsure of the exact generation and manufacturing month of your vehicle, a way to check it is via putting your registration number into the tool on www.carjam.co.nz. The first row that is called ‘Year’ contains the model year, and then in brackets, the manufactured year and month. Then, if you look down the page, the first few letters of the ‘Chassis’ field specify your generation. If your ‘manufactured month’ is 2016-03 and later, and your chassis number starts with AZE0-2, then you have a Nissan Leaf that we don’t believe is prone to the failures described here. Alternatively, you can visit www.flipthefleet.org/leaf-brakes-firmware-check and follow this process to use LeafSpy to find out your generation and firmware series. If your chassis number starts with AZE0-2, and your vehicle is running the ‘Series-C’ firmware, then you have a Nissan Leaf that we don’t believe is prone to the failures described here. I have a generation 2 Nissan Leaf (40 kWh). Does this blog post apply to me? As a quick reminder, if you have one of these vehicles, please consider registering it with us by clicking here, so we can learn more about these failures and keep you up to date. If you have any further questions, feedback or comments, please post them to the discussion below – we would love to hear from you! We’re all volunteers at Flip The Fleet, so depending on our workload, we may take a while to reply, or just choose to leave it to our community to chip in. What about NZ new 2012 (registered in 2014) Gen 1 LEAFs. Has Nissan indicated they will update firmwares for those vehicles as part of the regular and compulsory 6-monthly service schedule? NZ-new Leafs are Gen 1.1 Leafs so are not affected by this as far as we are aware. We have recently sold our 2012 Japanese imported Generation 1 Leaf to a friend. The chassis number on the registration paper is 7AT0DH8KX1XXXXXXXX [de-identified]. As this number does not start with ZE0 do we assume it is manufactured after November 2012 and therefore potentially has this problem? That is a VIN number. Checking via http://www.carjam.co.nz it was manufactured 2012-02 and is a Gen 1.1 Leaf for which we aren’t aware of any failures. Wow I have a 2013 X from Japan – what should I do as i definitely dont want to find out about this while I am driving. Hi Glenn, I think the most important aspect at this stage is to be aware that there is a small chance it can happen (now at about ~0.3% in a year), and if it does happen, you need to press down on the brake pedal as hard as possible. You’ll need to ignore the strange mechanical noises and large resistance the pedal imposes initially. Dima has likened this to a seminar speaker telling you where the fire exits are, or, the flight attendant giving a pre-flight safety briefing. Most of the time you’ll never need to use the information, but is useful to be prepared in the rare case that something does happen. Hi I have a 2016 30kwh leaf. In car jam the Year says “2016 (2015-12)” the car was first registered in Japan in March 2016, so is it a 2015 year car or 2016? additionally my chassis number starts with AZEO-2, which according to this article “If your chassis number starts with AZE0-2, and your vehicle is running the ‘Series-C’ firmware, then you have a Nissan Leaf that we don’t believe is prone to the failures described here.” So I am assuming my Leaf is not prone to failure?? Thoughts any one??? Cheers fellow leafites! Hi Stuart. Referencing CarJam’s “2016 (2015-12)”, it appears your car was built in December 2015 and could be prone to these failures. A way to make sure is to use LeafSpy Pro and to get your brake firmware – if it ends in “C”, then you’re fine, but otherwise, it may be prone. $1000? Or ?$2000 ? Please don’t damage the whole generus when a dollar figure can define a worst case . The discussion of who pays ,without a cost ,could lead to confusion. The 30kwh scare Did huge damage for a $100 fix. Hi Berwick, Unfortunately, although we have tried, we haven’t be able to get any official answers about what the fix is and what it would cost. Further details: As far as we understand, Nissan NZ, even though it is a fully owned subsidiary of Nissan Motor Co. Limited in Japan, has no legal responsibility for these cars as they did not import or sell them. So they don’t have to offer any fix, and if they do they are within their legal rights to charge what they want. In the case of the 30 kWh firmware fix we were lucky that Nissan NZ offered the fix and at a reasonable cost. In terms of NZ law, we understand that it is the importers of the vehicles that take responsibility for resolving any issues. However, as far as we are aware there is no requirement that Nissan Motor Co. Limited in Japan has to offer firmware update files or any support to 3rd-party importers of vehicles. This makes it difficult for 3rd-party importers to support these vehicles which are becoming increasingly complex with multiple computer systems that often require updates. If NZ is going to rely on 2nd-hand imports from Japan and UK to reach its electric vehicle uptake goal these issues need to be addressed. It’s also important to realise that we don’t know if Firmware ‘C’ actually fixes the problem we are observing. Nissan have not answered our question about what it does and whether it corrected the earlier brake problems (maybe it fixed some other aspect of the brakes performance?) – see the memos linked to the article. So, even if Nissan were to agree to make Firmware C available to NZers at a reasonable cost, we are not even sure that this would solve the problem. We (and NZTA) need more information from Nissan to decide what can and should be done, assuming of course that they agree that a significant risk exists for our drivers and public. Hi I have a 2014 Nissan LEAF S Japanese import, my ECU version is 3NG9A Brake 470Y…. I guess that makes it prone to brake failure. Hi Ron, could you please go through the process outlined on https://flipthefleet.org/leaf-brakes-logbook/ – you’ll be able to find out your month of manufacture, and confirm for sure whether your car is prone or not. I had experienced similar issue with my Nissan Leaf 2011. I guess initially it was my fault, I got distracted and accidentally hit a concrete column while heading out of the parking area. It was in my office building so I was driving at a speed of less than 10km/hr. I was intending to get off the car to check the (supposedly minor) damage but the car started to move backwards while I was stepping on the brake! It hit the wall behind me and then started accelerating forward again, I was so scared, I was desperately pulling the hand break and pressing the park button but none of it was working. Finally, the car smashed hard on another concrete column and stopped moving. I was lucky enough that the air bag worked, that nobody got injured and no other vehicle got involved. It was as if it self-destructed after the first impact. My motor insurance company has decided for the car to be written off because it was badly damaged. When I called Nissan to report the incident they did not sound convinced. They told me that they have never heard anything like this before and that they cannot do anything about it unless I will file an official report so that the authorities will require them to conduct an investigation or take action. I was too busy during that period and could not be bothered, I was given restricted time to decide whether to just move forward and get my insurance to pay me for a replacement car or go on with the investigation (at my cost). I asked dealers and EV experts earlier this year about reports and they assured me there was no problem. Not so, it would appear — but as often happens, people only think there’s a problem after it affects them. This doesn’t put us off getting an EV, but it does put us off Nissan Leafs. Buyer beware! As a known and potentially life threatening brake issue that has been around for sometime, with no known fix, I wonder how NZTA can continue to allow importers to bring them into NZ. NZTA needs to move more quickly and inform the NZ public about the risks these models pose to road safety. I am still unclear from the commentary what has happened to the cars that have had this problem. Have the vehicles self corrected, are they still driveable or write offs?